GoHz frequency converter is a great solution for converting 50 Hertz to 60 Hertz, or 60Hz to 50Hz among different countries' power grid, also can convert 110V/120V to 220V/230V/240V (or vice) by built-in step-up/step-down transformer. Frequency converter a good electronic device for home appliances manufacturers to test the machines before exporting them to another country with different frequencies and voltages, like UAE, China, Singapore (50Hz 220V, 230V, 240V) export to USA (60Hz 110V, 120V), Malaysia, UK (50Hz 230V, 240V) export to Philippines (60Hz 220V). Besides of home appliances in single phase power supply, frequency converter also can be used for industrial equipment with three phase power supply, by using GoHz frequency converter, you can easily change three phase 220V - 240V (50Hz/60Hz) to 380V - 480V (50Hz/60Hz), and even 400Hz for aircraft devices. The frequency converter is suitable for most types of machines in resistive, capacitive, inductive and non-linear. Input frequency: 50 Hz, 60 Hz or 400 Hz. Input voltage: single phase 110V (120V), 220V (230V, 240V); three phase 220V (230V, 240V), 380V (400V, 440V, 480V). 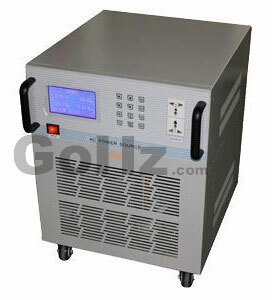 Output voltage: single phase 0 to 300V AC; three phase 0 - 520V AC. Output frequency: 40 to 499.9Hz pure sine wave. Single phase (110/120V 60Hz, 220/230/240V 50Hz) to single phase (0 - 300V, 40 - 499.9Hz) converters, capacity from 1kVA to 45kVA, see our model list. Three phase (220/230/240V, 380/400/440/480V 50Hz/60Hz) to three phase (0 - 520V, 40 - 499.9Hz) converters, capacity from 3kVA to 500kVA, see our model list. Besides, you can customize your own frequency converter base on specific requirements, contact us and get a price now. If the loads required voltage is higher than 150V, press down the high-low grade button, adjust the rotary knob for changing voltage to 240V (220v, 230v), frequency to 50Hz. If the loads required voltage is lower than 150V, popup the high-low grade button, adjust the rotary knob for changing voltage to 120V (110v), frequency to 60Hz. Note: Do NOT press the high-low grade switch when the output switch of the frequency converter is ON, otherwise it may damage the frequency converter or loads (like change from 120V to 240V, DANGEROUS). 1) Parameter Set; 2) Operating Parameters; 3) Abnormal Display; 4) Program Settings. Press up/down buttons to adjust the selection, press OK button to enter the option. 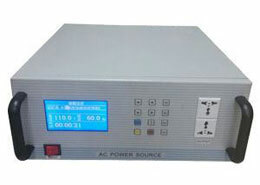 50Hz (220V, 230V, 240V) and 60Hz (110V, 120V) power supplies are most often used in global power system for home appliances. Some countries (regions) use 60 Hz power source while other countries use 50 Hz, but some equipment are not working well on different frequency. 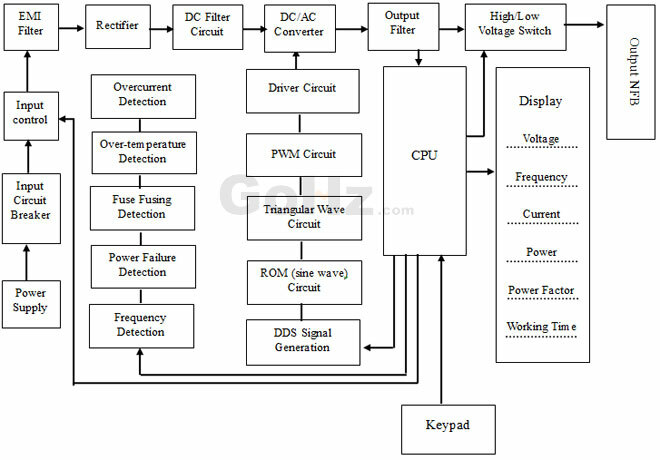 Home appliances, like TV, speaker, lights, can work with both 50Hz and 60Hz power supply, but some other appliances especially with electric motor inside it, like air conditioner, fridge, can only work with 50Hz or 60Hz. If a 50Hz electric motor working on 60Hz power system, the motor speed will be 20% faster, then cause over temperature and shorten its service life. We all know, most Asian and European countries (e.g. China, England) power grids are 50 Hertz, 220V (230V, 240V), but American countries (e.g. USA, Canada) are 60 Hertz, 110V (120V). In case of a UK (230V 50Hz) family move to USA (110V 60Hz) along with their home appliances (e.g. stove, coffee machine), those appliances are designed for 230V 50 Hz power supply, which will NOT work (or not work well) in 110V 60 Hz system. Hence, we need a device to convert 60Hz 110V to 50Hz 230V to allow such appliances work in a good condition. GoHz multi-function solid state (static) frequency converter is a standard AC power supply electronic device, it can simulate international standard power supplies, convert fixed AC voltage and frequency power into stable pure sine wave power by internal AC to DC, DC to AC current rectifying, with high activation current, and displays a number of parameters (Such as: voltage, frequency, current, apparent power, power factor etc. ), to make home appliances, electric machines etc working at their rated frequency. Besides of adjustable frequency, the internal isolated transformers of the solid state frequency converter also allow user to change output voltage.